Every morning when I get dressed, I’m seriously torn about what to wear that day. As a homeschooling, work-at-home mom, comfy clothes are VERY appealing. I mean, yoga pants are a mom wardrobe staple. Then again, it always feels good to wear something a little nicer, like a flattering pair of jeans with a cute shirt. Inevitably though, without fail, I get those cute clothes dirty every time. It doesn’t even matter if I never come close to the kitchen or the kids or whatever else that may harbor dirt. Somehow, someway, a random spatter of grease will fly through the air and land on my cute clothes. Sure, I’m not the only one this happens to, right? Here’s what ends up happening over time. Those cute clothes I love to wear slowly migrate towards the “not worn often” section of the closet because they have stains. No one looks cute in a stained shirt, right? The cute clothes selection becomes less and less, and I start to choose comfy clothes more and more. Which really is fine for 90% of the time. But that other 10% still exists… dinner with friends? A date night with Mr. Crumbs? Church?! I certainly can’t wear comfy clothes to any of those things, but my cute clothes have stains! I keep this little miracle worker on a shelf above my washer and whip it out whenever I need it. A little squirt directly onto the stain, a gentle little scrub with an old toothbrush and a few minutes to rest is all it needs to eliminate those awful grease stains from my cute clothes. This stain remover works on practically every stain imaginable: grass, grease, food, etc. Plus, it contains frugal ingredients that I normally have on hand anyway. Making more is never an issue! I don’t know about you guys, but catching a stain BEFORE the clothes are washed is practically unheard of. It’s not until they’ve been washed, dried and hung up on a hanger that I THEN see the ugly stain. Gah! It’s also guaranteed that if I just throw the dirty shirt back into the hamper, I will NOT remember that it was stained in the first place and needs to be treated. Which means the same clothes will get washed repeatedly (please don’t make me confess numbers) before the stain is ever dealt with. Seeing as this “system” is a bust, I came up with a new one. When I notice a stain, I still hang up the clothes. But instead of putting them away in my closet, I hang them on my bedroom door. The next time I leave my room with a laundry basket of clothes to wash, I take the stained clothes on the hanger with me too. The regular load is tossed in the washer, I go to work on the stains and the laundry stain remover does its job while the load is washing. It’s just enough “sitting” time for the stain remover and the treated clothes get added in with the next load with my homemade laundry detergent. PS – I use this homemade stain remover in conjunction with my homemade bleach alternative and homemade laundry detergent with great success! I buy my dish soap from Young Living. I know there are a lot of essential oil companies out there and I’ve certainly tried my fair share of brands. But after testing and researching and more testing, only one is worth spending money on (in my opinion). For a couple years now I’ve been committed to Young Living oils and their natural products, and you can read more about their oils and my decision HERE. Combine all ingredients in a small jar and stir to combine well. Apply directly to the stain and rub gently with your finger, a piece of fabric or an old toothbrush. Allow stain remover to sit for at least 15 minutes, or up to an hour. Wash normally. Total cost of homemade laundry stain remover is 17¢. Compare to the cost of Shout at $1.55 for the same amount. Making it yourself saves 89%! What do you do about stained clothes? Do you have a special method to treat stains? « Which is the better deal: the CSA or Farmers Market? I need to treat arm pits because I have 5 teen/early 20’s young men and a 12 yr.old daughter and all the smells that go along with them. (Not complaining, just saying:) Can this recipe be doubled, tripled or even quadrupled? I mean, in the picture, it looks pretty concentrated, but I’m thinking I’d run through it pretty quickly. Or do you use something else for that, and strictly treat your grease, grass, etc. stains with this one? Is this safe for coloured dress men shirts? heya,have you made that stain remover? Do you think castile soap would work in place of the dish soap? I don’t keep dish soap around anymore and use castile for everything, but don’t know if it would have quite the same stain lifting power as normal dish soap. I’m not sure Victoria since I don’t use castille soap my in my house (yet). If you try, would you update and let us know how it goes? I just mixed up a batch made with castille soap yesterday. It did remove the stains but left slightly bleached looking spots on the gray sheets I used it on. I can’t figure out if this is due to the castille soap or because it was a king sized sheet which got twisted up in the washer and possibly didn’t fully rinse out. Does the peroxide bleach colors? Thanks! We haven’t had any issues Dixi. You use such a small amount on a concentrated area that we haven’t noticed any color change. I just recently started using a mixture of one part original blue Dawn to two parts hydrogen peroxide (no baking soda). I haven’t tried it on greasy stains yet (and believe me I have those clothes in the back of my closet, too), but it works perfectly on my son’s grass-stained baseball pants! One thing to remember, though, is that hydrogen peroxide loses its effect if not stored in a dark container. Thanks Karen! I keep my hydrogen peroxide in the dark garage, so I hadn’t thought of that! I’ve used the dawn and hydrogen provide combination too for almost a year and really like it. Hadn’t thought of adding baking soda. THANKS for the recipe! I have toddlers– stains are an everyday occurrence, it seems. How long is the shelf life of the stain remover, once mixed? Does it lose effectiveness over time? Hi Rachel! I haven’t noticed the effectiveness change at all, so give it a good shake and you should be good to go! May I suggest trying out dye-free dish soap? There are a lot of eco-friendly, natural and dye free dish soap such as the Seventh Generation brand. There’s just something about clear, natural dish soap that just feels and looks better than seeing unnatural blue dye come out of the bottle, plus in that case you wouldn’t have to wait for the dye to dissipate when using it as a stain remover. Just a tip 🙂 Same goes with dyed dish sponges, something just weirds me out about seeing blue dye oozing out of the sponge when its brand new. That’s why I also like using unbleached dish sponges. This is a good idea Tatiana, and once to definitely consider the next time I’m out buying dish soap. 🙂 Thanks for the tip on Bronner’s citrus soap!! I love this recipe! I have used it many times! It even took dried blood off a shirt. Thank you so very much!!! I tripled the recipe and noticed two things- 1) separation of baking soda and 2) carbonation for lack of better word. It exploded on me when I opened. Is it normal for the baking soda to separate out and I’m a little worried about putting a pimp on these jars for fear of overflowing bottles. Any feedback? Thanks! Very strange Mary – I haven’t experienced either of these! I’m really not sure what would cause separation or the excess air… maybe try another batch and let it sit out in the open before bottling? Or using a bigger jar so that there’s more room for expansion? So weird!! So odd that this is not a norm. I had it with all my bottles! The reaction that Mary is getting is completely normal. The natural reaction between baking soda and hydrogen peroxide is the release of oxygen. The oxygen gets trapped in the soap and causes the bubbles/foam. You can probably avoid the excessive foaming if you mix the baking soda and hydrogen peroxide first and allow it to rest a while to allow the oxygen to escape before stirring in the soap. The end result should be a terrific cleaner/stain-remover! Also, if left on too long it will definitely cause bleaching. The baking soda and peroxide combination bleaches. It’s even used in toothpaste to help whiten teeth. If you were buying a product like this, it would come with a warning to test in an area that is not visible because of the potential to discolor your clothes. If there is no foaming reaction I would guess that one of the ingredients has lost its efficacy, or that the peroxide is of a low concentration. It comes in different concentrations. What concentration are you using, Tiffany? Thanks for sharing Janice! From memory, I think my peroxide is 3%. I’ve heard it comes in 6% too, but I’ve honestly never seen that kind before! I forgot to mention that altitude and barometric pressure can also affect the foaming that Mary is experiencing. Thanks, Tiffany, for the thoughtful entries that you make. I have left this stain remover on super tough stains for over a week and haven’t ever had any discoloration. I have also yet to find a stain it cant remove! Good stuff!! That’s excellent news Lori – thanks for sharing! Hey, can this be used on carpet stains as well? I haven’t tried it myself Sarah – use at your own risk! Hi Anna! I use this on all sorts of stains, so it’s worth a shot!! Hello, would hydrogen peroxide loose it’s effectiveness over time? How about storing the mixture in a clear bottle versus a dark bottle! Thanks in advance and I cant’t wait to try it. Hi Heidi! The mixture should be stored in a dark bottle – I keep mine in the laundry room which is dark, so I’m not concerned about light. I also recommend mixing in smaller batches (the one above in the recipe is ideal) so not to worry about losing effectiveness! When my kids were little, they were cloth diapers and one my my children couldn’t nurse and had to have formula, and the stains it would leave. I always put water in my diaper pail and added just about a 1/4 cup of cheap dishwasher detergent (in those days it was just powder) I would pour out the water and launder as usual and always had Snow White diapers, my bibs didn’t have stains. I have now tried it on our real dirty yard clothes and works great if you don’t mind the soaking over night! I keep the bottle (previously commercial, if this works I will keep this bottle) in the bedroom closet. If I take off something that’s stained I treat it before it goes in the hamper. If it made it to the washing machine, I have an extra basket for kitchen cloths, it can get tossed in there. That solution may work for your families, the side basket just has to be sorted rather than dumped into washer. 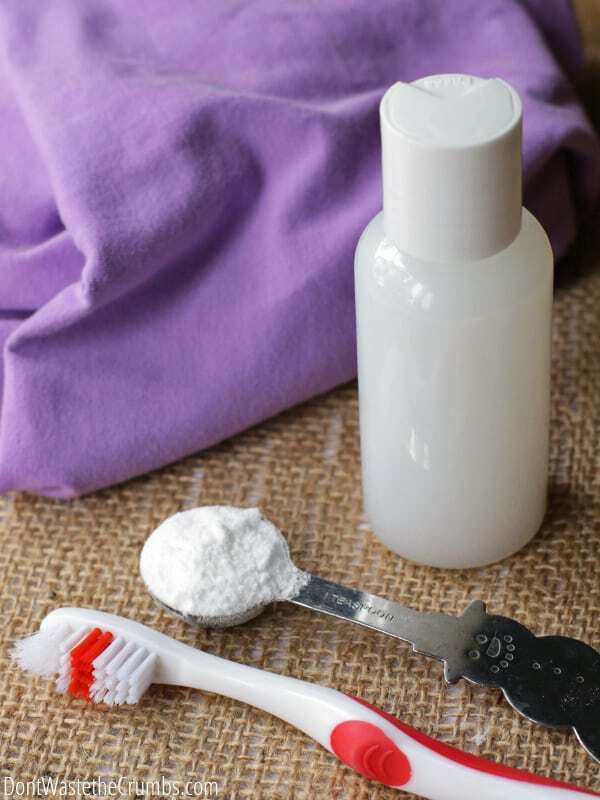 Baking soda with peroxide is a powerful cleaner. Besides clothings, it can also cleaning tiles, porcelain and stainless steel. Do you need to add water while stirring. If yes what quantity? I first heard about hydrogen peroxide and dish soap a year ago from the Marilyn Dennis show. It works better than any stain remover I’ve ever bought. I rave about it. The baking sissy however might be nice cause I could see it like a mild abrasive maybe? 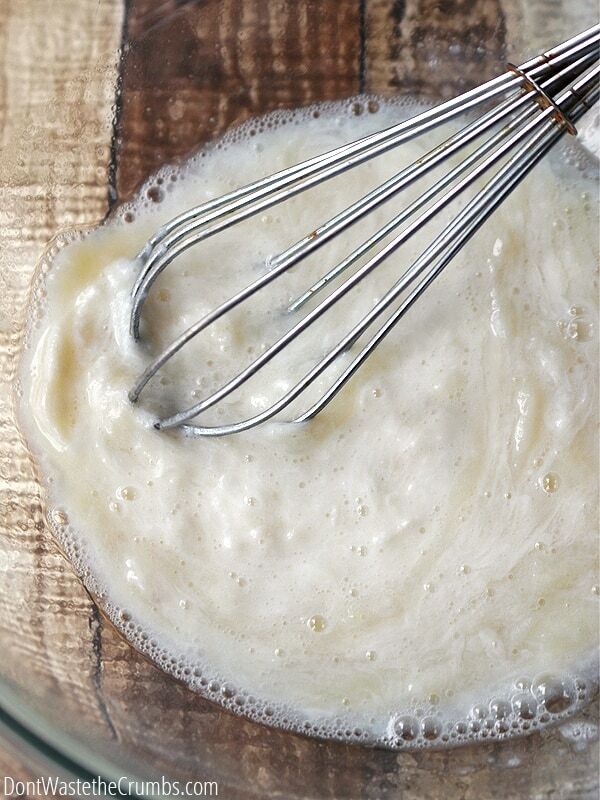 Baking soda is awesome at breaking down grease…. This is actually the remedy for skunk as well. It works wonderful! 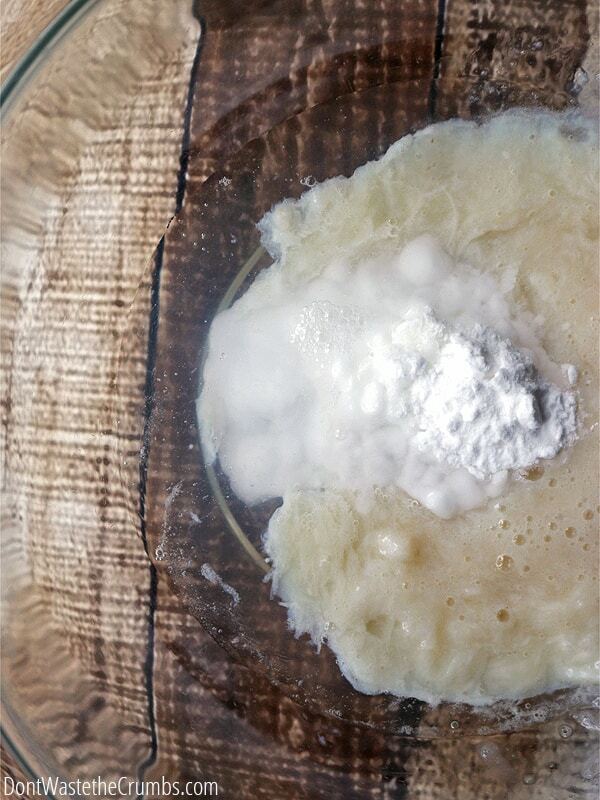 My only piece of advice….Don’t mix in the baking soda. It carbonates and explodes if the baking soda is fresh. What I have found that works very well is sprinkle DRY baking soda on the stain, then SPRAY the Dawn/peroxide mixture on top. It will foam. Rub with toothbrush. Gets EVERYTHING out! And for pets (or people) who get skunked….sprinkle dry baking soda on the the skunked parts, then spray the dawn/peroxide mixture on top and rub in. Then wash it out. SIGNIFICANTLY reduces the skunk odor. Thanks for the tip Sherryl! hello! If I add lemon to the mixture of the stain remover, will it have any reactions, especially to the baking soda and hydrogen peroxide? oh, Tiffany, we also have the same name!! Hi Tiffany!! The lemon will react with the baking soda and make it fizz. Are you thinking of adding lemon b/c of its whitening properties? If so, it’s best to add it separately to the stain and work in with a toothbrush. 🙂 Good luck! ive just made the spray and its pretty thick and goupy. i highly doubt i will be able to spray it. did i do something wrong? Hi Emma – yes, this stain remover is thick, which is why I recommend to make it in a glass jar and not a spray bottle. If you prefer a smaller container, one with a flip top and a spout would be best! Can’t wait to try this out. My nephew had a jacket that means alot to him come out of the washer stained. ( my husband can’t wash anything, i swear.) He was very upset so i told him if do my best. So wish me luck. Assembled all the ingredients in a spray bottle yesturday…exploded in my laundry room this morning. UUUGGGG!!! Worth a shot Grace! It won’t hurt it any, although it might be a bit thicker. Let us know how it goes! All I can say is wow! I had a tough stain on my ABU(Air Force uniform) and I could not get the stain out. I tried a colorox pen and shout. I also used alcohol but nothing could get it out. I just happened to stumble upon this page and thought to myself why not try this and it worked the stain is gone! You’re so welcome Jordan! Glad it worked for you!! umm…… imma little confused here? I get it, it turns out a thick paste, but a thick paste is not what I want. What I need is a thinner spray that I can leave in the spray bottle and spray wider areas as I see the need, not stand around scrubbing little spots by hand. Has this mixture been tried with clear vinegar or clear water? Any suggestions? Thanks!. Hi Anne – this recipe is a thick paste, not a thin mixture that can work in a spray bottle. I also don’t think this will work diluted w/vinegar or water as you’re hoping. 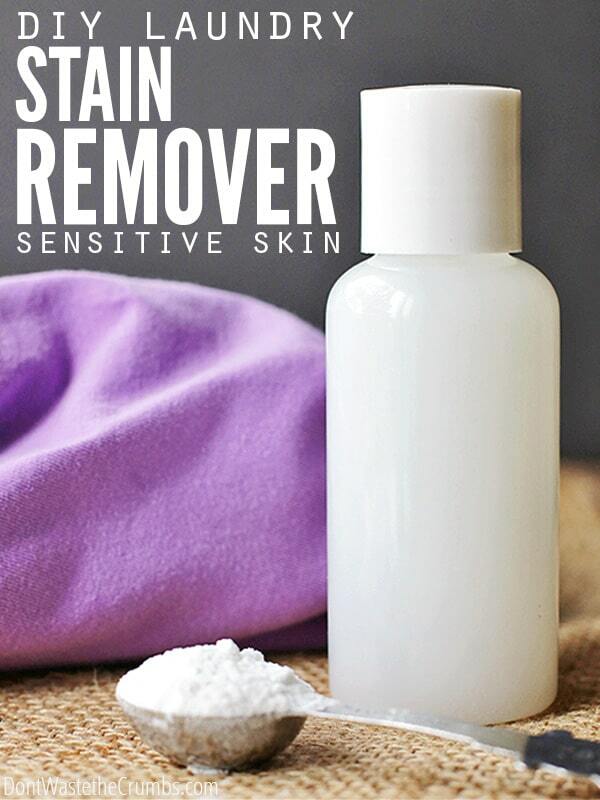 To be honest, the scrubbing action is what really makes stain removers work, especially the ones w/o harsh chemicals. I can’t believe how miraculous this stain remover is. My husband got chocolate on his new shorts. I pretreated them, washed, and dried them without checking to see if the stain had come out. It hadn’t. I thought they were headed to the garbage until I used this stain remover. There is not a trace of the stain. Thank you so much. What a great review – thanks for sharing Sandy! Thanks for this! Was trying to remove some stains on my school blazer and most of the instructions from my local laundry folks recommend a stain remover. Gonna try to save money and make my own stain remover instead. I made the mixture in a small jar,after I’d treated my shirts and blouses I found one more item.I took Doon the jar and carefully openot the lid because I could do see the mixture’so appearance had changed and assumed mostly it had turned to bubbles. When I opened the lid a plume of gas escaped, nothing too dramatic. But it put the bottle in the shed with the lid back on and now I’m worried that it might explode if I touch it. Please get an edit button . What spell check does to my posts is sinful. I have used this on the past without baking soda. It worked but i noticed it wore the clothing out…holes in those areas. Have you noticed this? Hi Courtney! Are you asking if I’ve used this in the past w/o baking soda and noticed THAT version wearing holes? If so, I haven’t. I’ve only used this version w/baking soda. And with this version, I haven’t noticed holes! I have a white slip-covered sofa, which has worked out amazingly well for our family. However, my son has started to come inside with grease from his bike chain on his legs, and twice has forgotten to wipe it off before lounging around on the sofa. I thought for sure the cover was done for. I have never had luck with grease stains. I decided to try this recipe and it took the black grease stains right out! Most of it came off with the toothbrush, and the rest came off in the wash. I am so relieved! Yay! I’m so glad this worked for you Jen! I have no silk presently. the mixture will not disintegrate overtime, i have only kept it 2 months at a time, also it does not need to be in a dark container. i am struggling with one thing though. someone had mentioned they used cleaning soda instead of baking soda. i am wondering if the person had problems with it expanding way to much. i had made my gallon, when the remover had settled after the expansion, it was about 30% gone less, of a gallon. i have, discovered a litre shampoo bottle with a pump is finetastic. i seemed to regularly use way too much at a time. using the flip top on the peroxide was just difficult for me to get some instead of heaps. Without a dark container, or at least a dark storage space, that peroxide is soon nothing but water. Any light triggers its rapid breakdown. However, since peroxide + vinegar = toxic paracetic acid that’s a nasty form of bleach, it’s a good thing that it doesn’t last. Please revise your recipe into something safer. My apologies for conflating a reader comment about adding vinegar with your actual recipe. There’s only the light breakdown issue and the random stuff readers might add, such as vinegar, that should be warned against. Thanks, and I am sorry. Thanks again for your help towards reducing stain issues in my business, but can it remove mucor stain from clothes, can it work 4 both coloured clothes. This is the perfect list for a mum with school kids! My youngest is in primary school and white school shirts and 7 year old boys just somehow don’t mix. He always has a stain of either food/mud/pen/paint on his uniform. I think i’ll print this and put it on the laundry room wall! Does the peroxide take color out of dark clothes?